Having a foam roof is very beneficial. A foam roof will lower your energy bills, provide efficient insulations and its durable. The foam looks like a marshmallow coating on top of the building. This enormous marshmallow will protect any building for a number of years. However, the roof of every building in Phoenix, Arizona is exposed to the sun and bizarre winter weather. 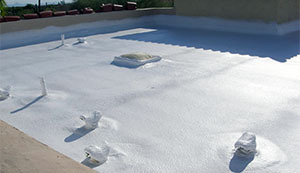 In Phoenix, Arizona, the sun will deteriorate the foam roof (marshmallow). Let’s say that two decades have passed since the last time you had a professional roofer spray foam on the commercial building's roof in Phoenix. After twenty brutal summers and bizarre rainy days with dust storms, the commercial foam roof will start to deteriorate and repairs will be needed. The following list are signs that the foam roof need repairs. One of the reasons spray foam roof is used is to fill in the cracks that the roof foundation might have. When the spray foam is applied, it’s a liquid material. The roofer will spray, and after a few minutes, the foam will expand from the original volume to a solid material. While it’s expanding, it will foam would cover or fill in the cracks that are on the original roof. After a couple decades, the foam will weaken. The sun’s rays and the rain that Phoenix gets will start to damage the foam. The first sign for that damage will be cracks forming on the foam. Since the foam is like a marshmallow, bubbles are formed on marshmallow when it's heated. Same thing happened to a foam roof. If you don’t see any cracks, look for blisters growing on the foam. One of the main reasons for the blisters is the improper adhesion during application. This means that the spray foam roofer in Phoenix who initially applied the foam on the roof did an improper job. Contact that roofing company and explain them the situation. The application can be main cause for the blistering, however other things can also cause it. The debri and sun are other factors that cause the blisters on the foam. If the blisters are not taking care of immediately, cracks and advanced deterioration will occur. 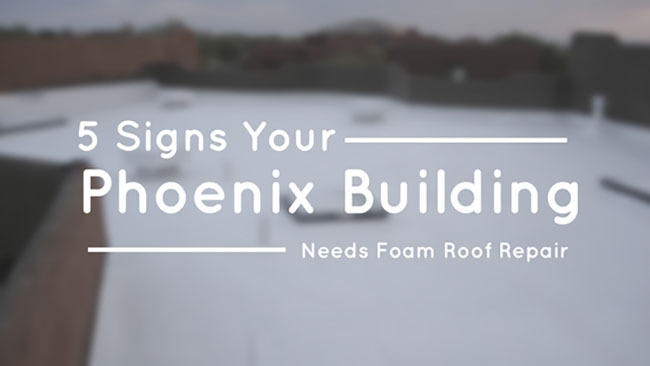 When foam deterioration is visible, the building's roof is in need of a foam roof repair in Phoenix. The deterioration that happens to the foam looks like a marshmallow splitting in half in slow motion. However, the deterioration of foam is different on every case. As mention before, the maintenance of the roof is very important. If the roof has poorly maintenance, the deterioration of the roof will be very severe. 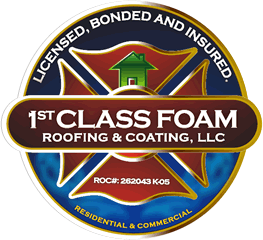 Once the foam is 40% deteriorated, the roof’s foundation will be expose and most likely experience to minor damages. If your commercial foam roof is not inspected regularly, the building itself will experience major problems. The building will feel humid. Remember that foam is like a big marshmallow that is coating and protect the building. In Phoenix, Arizona, the air conditioners are on blast for at least 7 months out the year. If the foam is not diverting the sun’s rays away from the building, the ray’s are heating up the building. It's like the building is becoming a microwave. When heat waves and cold weather mash together, a little humidity will occur. If there are areas in the building that feel humid or notice any moisture areas, adding “condition of the roof” to the possible problems list will be a good idea. Moisture problems are difficult to detect. When the sun’s rays are heating the building, the air conditioner is working extra hard to keep the building cool. Having an air condition putting in extra oil will effect show on the energy bill. If the energy bill been raising for last three months and continuing to increase, a foam repair will the best approach. Being aware of the top five signs that determine rather or not your building needs foam roof repair allows you to be more cautious. Foam repairs are not a yearly necessity. However, there are significant instances and indications that determine that possibility. Cracks, blistering, foam deterioration, moisture problems and energy bills increasing are indications that a commercial foam roof repair is in need. If you notice at least one of the indications, call us, 1st Foam Roofing, to schedule a roof inspection. We will answer any questions or concerns that you’ll have.